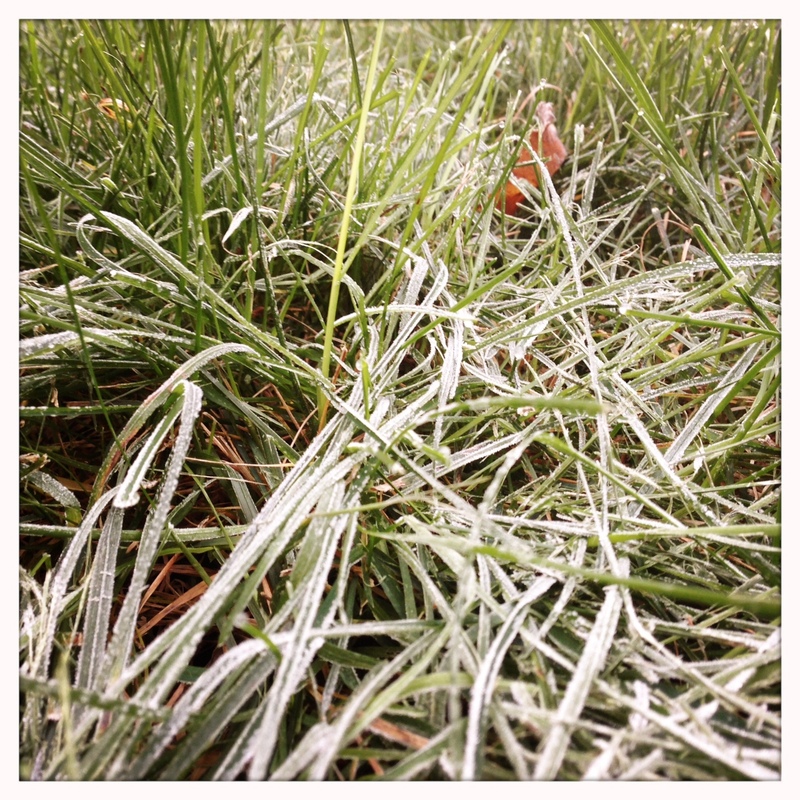 It’s not exactly a secret if you’ve been reading this blog that I am a big fan of cooler weather. There aren’t many things I enjoy more than coming home on a chilly fall day to wonderful aromas emanating from the slow cooker. I didn’t always enjoy my slow cooker as much as I do now. When I first got it, I viewed it as little more than a “chili machine,” but I have come to appreciate as time has become more valuable. I still struggle with not being able to poke and taste and adjust as I can on the stove, but it just adds a new layer of challenge to be able to adjust seasonings by smell ahead of time and be confident that the results will be delicious. That’s really it. There isn’t much more to the actual “cooking” portion of the recipe. So the challenge becomes the ingredients. You can combine just about anything that sounds good together in the slow cooker and end up with a reasonably tasty dish. So, instead of doing a step-by-step description of chopping each vegetable, I thought I’d change gears and talk a little about how I chose the ingredients for this particular recipe and what to expect from it. That should help you decide how you want to tweak it for your own tastes to get the result you’re looking for. First off, the meat was left whole in this recipe. I do not buy “stew meat” – ever. I much prefer to leave the meat whole while it cooks – it will be tender enough to break up with a serving spoon when it’s done, but the consistency just comes out better when left whole. I like chuck steaks for slow cooking because there’s lots of fat and marbling. When you cook this type of meat in the slow cooker, that fat slowly melts into the liquid, flavoring the stock and the vegetables. 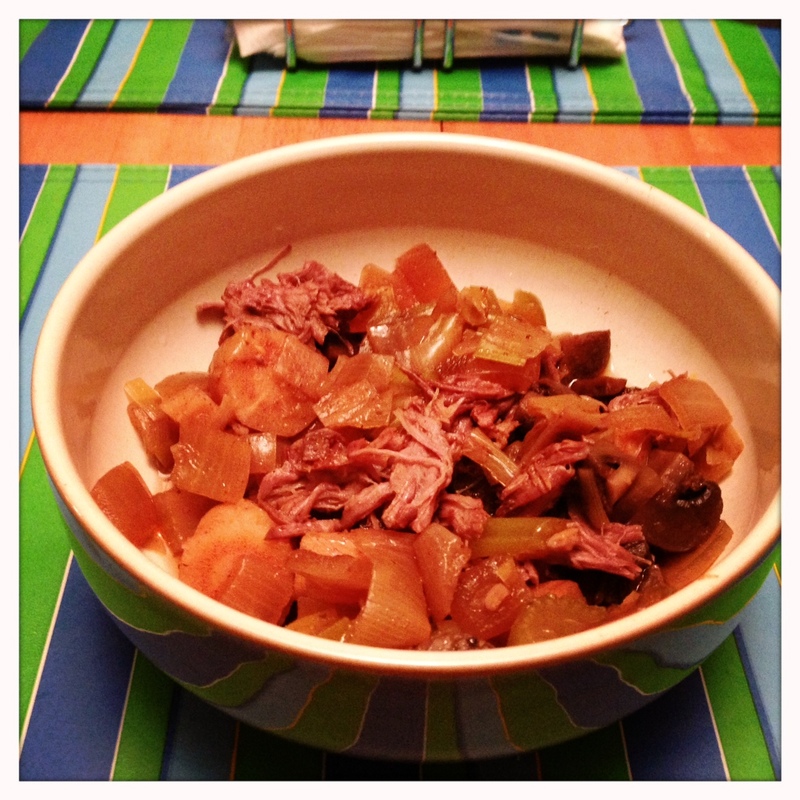 If the meat is too lean to start with, the whole stew tastes bland and the meat ends up tough. My other favorite cut for slow cooking is brisket, but that’s usually close to double the price, so I only go for it if it’s on sale or I have a specific need for a brisket. 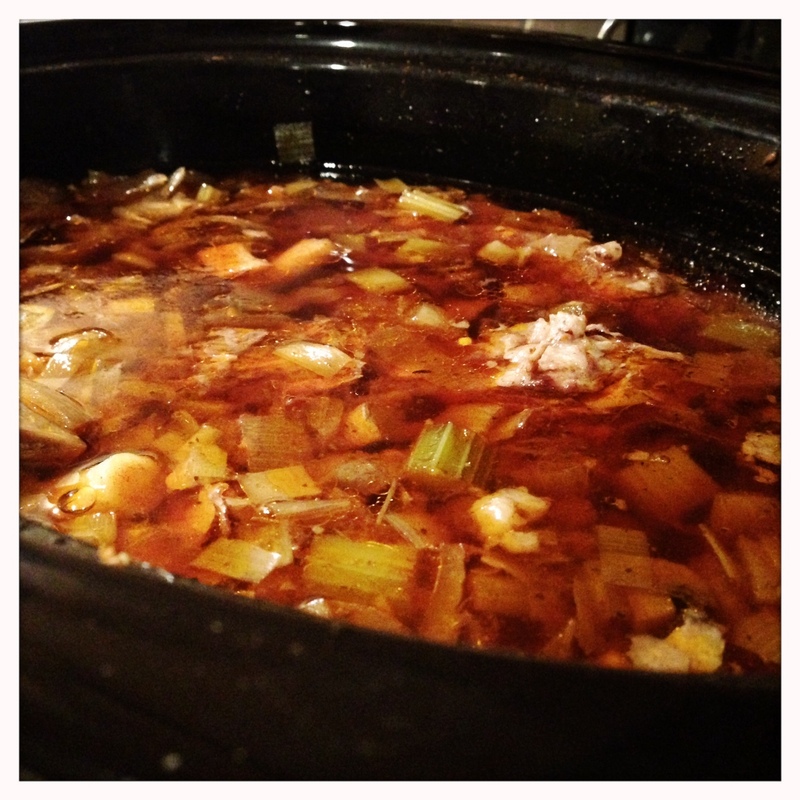 The 32 ounces of stock I use for this stew actually make it something between a soup and a stew. As you can see in the pictures, there’s a lot of liquid present. Probably enough to call this a hearty soup rather than a stew. Ladled out as is, this makes a delicious, hearty soup. This actually lets you have two different meals out of one recipe, though. The first night, I served it fairly dry with just a little juice over the top like a gravy. 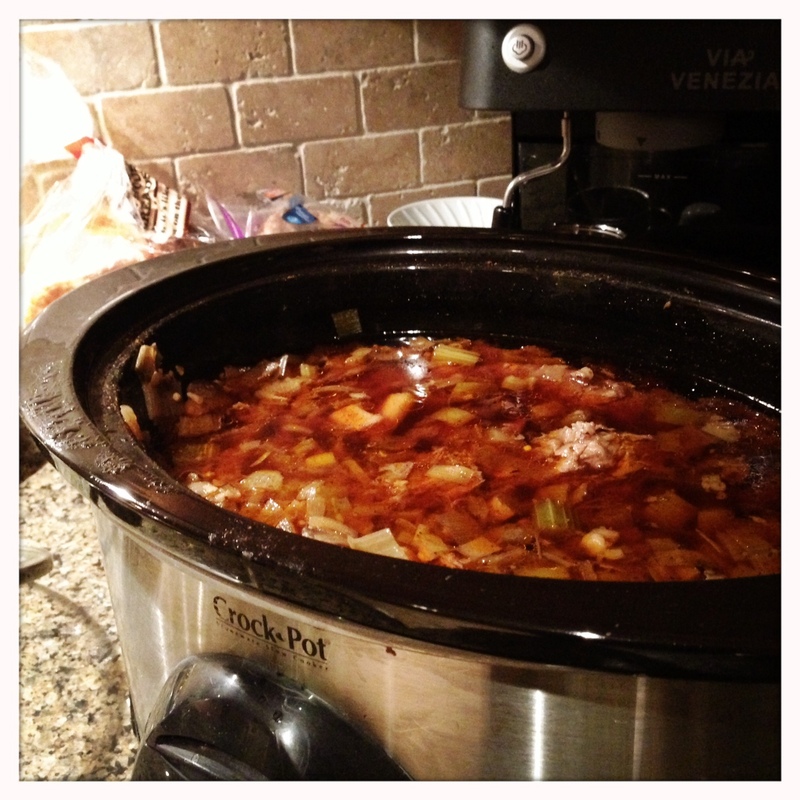 The second meal I served with a hearty dose of the stock and made it more of a soup. Either way it’s delicious, but it’s nice to have choices. When served as a stew, I cover with just enough of the cooking liquids to keep it juicy but not swimming. The vegetables are all a matter of personal taste. I change them up frequently, but this recipe is probably the basic backbone I always like to start with. Each of the vegetables lends its flavor to the stock and the meat as well as being delicious on its own. The combination of leek, onion and garlic is a recurring theme on this blog and in my kitchen, especially in soups. 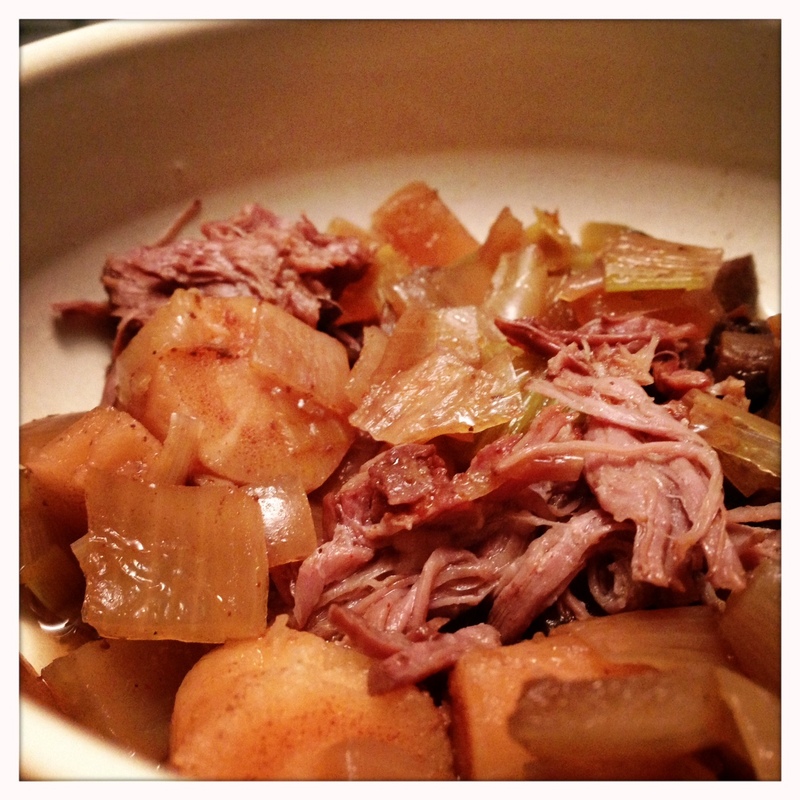 Celery is a great flavor enhancer in slow cooker recipes, and its fibrous texture holds up well to long cooking times. It’s no surprise there’s mushrooms in here. I love mushrooms. My wife loves mushrooms. Our little guy loves mushrooms. I tend to quarter them when I use them in the slow cooker because the texture holds up better over the long braise. Experiment with different types of mushrooms and different slicing/chopping styles. They add an awesome meatiness to all sorts of recipes. Finally, the parsnips. My guess is that many people have never even tried this delicious vegetable. I can’t say I blame them – if you have no experience with it, a dirty white misshapen carrot is probably not something you’re going to gravitate towards. But, you should. As you peel the parsnips, you’ll start to smell the fresh yet earthy scent. The flavor is tough to describe, but I would say that they have notes of celery, fennel and carrot. They also hold up very well to long cooking times and add a lot of flavor to stocks and stews. So, that’s it. Looks like the weather here is finally taking a permanent dive into the cooler temperatures, so expect more comfort recipes to come. Even cooking the chuck completely whole, it is fork tender and falls apart nicely when serving. As always, if you have any thoughts, suggestions or have tried any of these recipes and enjoyed (or hated) them, let me know in the comments. Enjoy! I love your recipes and have tried many. Additionaly, I love your tips, especially about leaving the meat whole. I wish the blog had a print link. It makes it easier to follow the recipe while cooking and would take less paper than printing the post as it is laid-out. Any chance of this happening? Thanks for the comments and the suggestion! I took a look at the settings, and there is a “print” widget, now located at the bottom of each post next to the various sharing links for email, facebook, etc. It doesn’t remove the photos, but it does condense the text a bit to make a cleaner printing version of the post. Hope this helps, and thanks again for the suggestion!